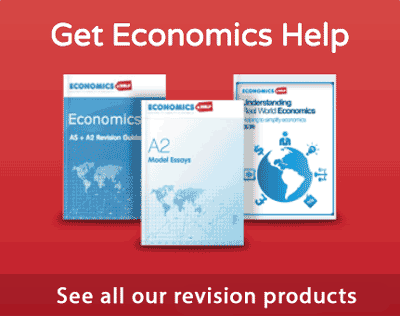 A look at the economic and social impact of Mrs Thatcher’s economic policies. Belief in the desirability of free markets over government intervention. E.g. pursuing policies of privatisation and deregulation. The pursuit of supply-side policies to increase efficiency and productivity. Reducing the power of trades unions and increased labour market flexibility. Financial deregulation, e.g. building societies becoming profit-making banks. Reducing higher rates of marginal income tax to increase incentives to work. Ending state subsidies for major manufacturing companies. Encouraging home ownership and share ownership. Targeting money supply and monetarist policies to reduce inflation of late 1979. Monetarism was effectively abandoned by 1984. On coming to power, the Conservatives followed a policy of Monetarism – seeking to control the money supply in order to control inflation. This involved higher interest rates and higher taxes. This did reduce inflation to 5% by 1983, but at the cost of a deep recession and unemployment rising to over 3 million. 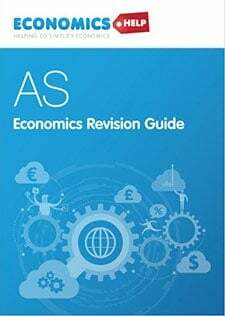 In 1981, 365 economists signed a letter to the Times newspaper arguing the government should reverse its economic policy and seek an end to the recession. This caused Mrs Thatcher to make her famous speech to the Conservative party conference of 1981. It was great politics, but the economic cost was a significant decline in GDP and unemployment staying at nearly 3 million until the mid-1980s. In the 1970s, days lost to trade union strikes were at all-time highs. It was feared that poor industrial relations were a key factor in holding back industry. Thatcher was determined to reduce the power of trades unions and end industrial disputes from costing British industry. 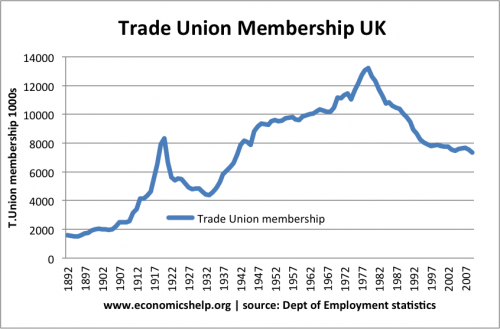 Trade union membership fell in the 1980s, forever changing British unions. There is no doubt that industrial disputes were a real problem in the 1970s (though it should be remembered there are always two sides to industrial disputes – not just unions). Apart from the coal mine strike of 1984, days lost to strikes fell significantly in the 1980s, and there have been improved industrial relations. To some extent Mrs Thatcher can claim some success, e.g. ending the right to secondary picketing, ending closed shops, compulsory ballots. But, also, the decline in trade union power was also caused by other factors, such as the decline in British manufacturing, British heavy industry and the rise in unemployment. An iconic moment of Mrs Thatcher’s early policies was the Miners strike of 1984. She successful outmanoeuvred the miners and fundamentally weakened the NUM – no more would the mining unions be able to bring down a government like in the 1970s. The strike was bitter, leaving lasting scars, and miners see the decline of the industry as evidence that their fears over pit closures were true. But, the mining industry had been declining since the 1920s. Even in 1945, half a million people worked in coal mines. Today, the figure is less than 10,000 and is being replaced by cheap imports and other forms of electricity. (see: decline of coal mines) It is hard to justify, given the environmental cost of coal, that a government should have subsidised a declining industry. Unemployment rose sharply at the start of the 1980s, due to deflationary monetary and fiscal policy. The recession of 1981 and decline of heavy industry also caused a rise in structural unemployment – even in the boom years of the mid-1980s, the unemployment rate remained high. Even in the late 1980s, unemployment was over 2 million. A significant factor was the structural and geographical unemployment caused by industrial decline. 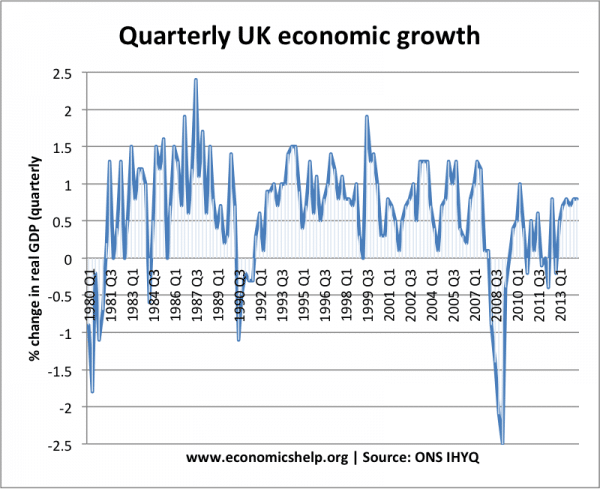 After 1985, the UK economy grew very rapidly. Economic growth reached 4-5% a year. This was well above the UK’s long-run trend rate. The Conservatives felt there had been a supply side miracle. But, inflation increased to 9%. And in 1990, the boom came to an end, leading to another recession of 1991-92. 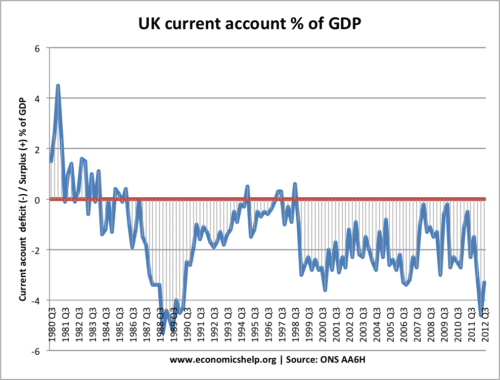 From 1985, the UK economic boom and growth in consumer spending cause a deterioration in the current account deficit. In the Lawson boom, the deficit reached 5% of GDP. Privatisation of state-owned assets from BP and BT to gas, water and electricity. Deregulation of the financial sector, e.g. enabling building societies to become profit-making banks. A key philosophy of Mrs Thatcher was the idea of a ‘home owning democracy’. During the 1980s, homeownership rates rose. In particular, the policy of selling off council homes to residents helped to increase homeownership rates. It is worth noting that homeownership rates had been rising since the late 1960s. 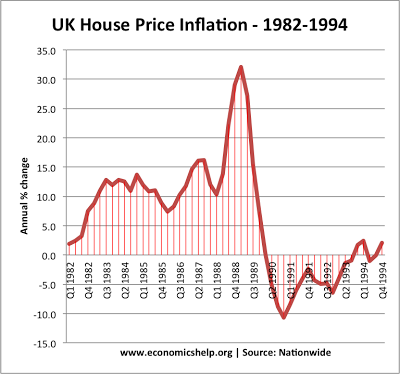 In the 1970s, we see a similar trend in house prices to the 1980s. (1970s housing market) Also in recent years, the percentage of home ownership rates has fallen, due to house prices becoming unaffordable for many. Home Ownership – Mrs Thatcher encouraged a belief in home-ownership. Many Council houses were bought by tenants. It led to a rise in home-ownership rates. 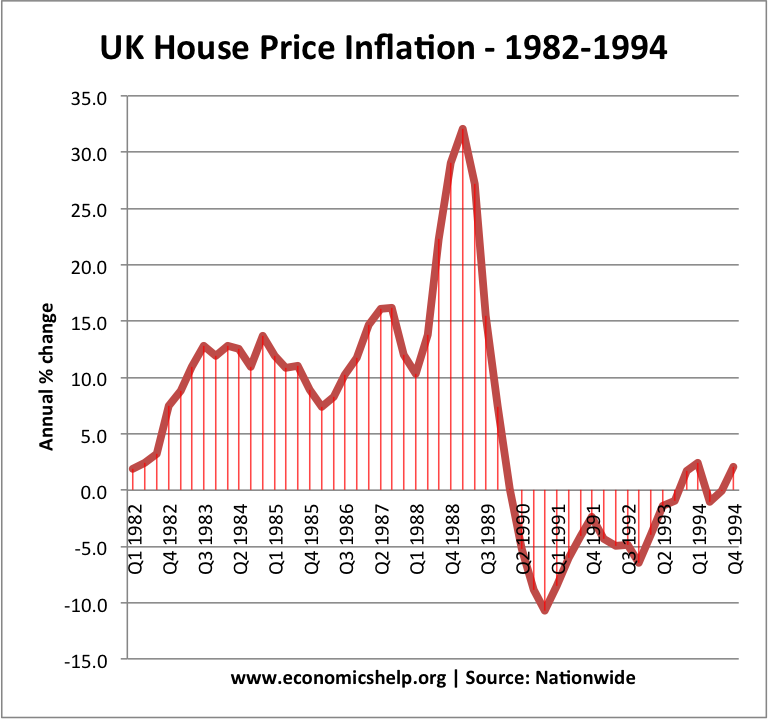 House prices in the late 1980s boomed, with record house price inflation, especially in the south-east. This created a powerful feel-good effect and contributed to the Lawson boom of the late 1980s. 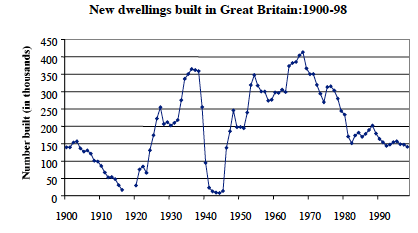 But, the growth in house prices was also unsustainable and prices fell after 1990. Another feature of the 1980s housing market was a slowdown in house-building compared to the previous decades; this contributed to housing shortages in 1990s and 2000s. Tax cuts for High Earners. During the 1980s, tax rates for high-income earners were reduced. Mrs Thatcher felt high taxes discouraged incentives to work. 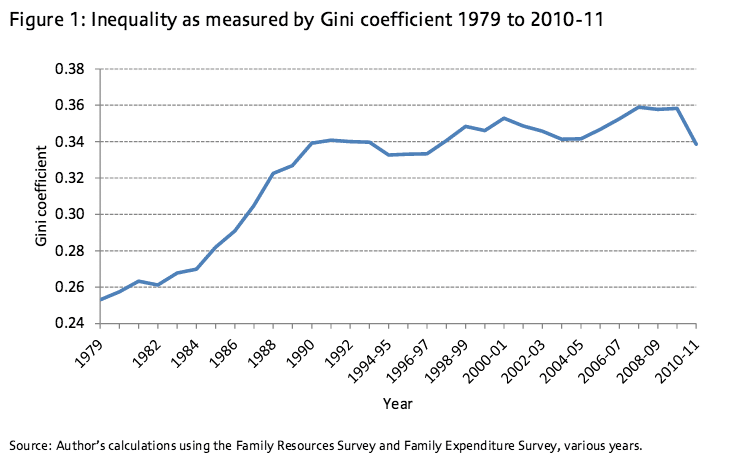 However, as a consequence of tax cuts and growth in the finance sector, inequality in the UK widened. Reduced Power of Trades Unions. The Miner’s Strike of 1984, led to a marked decline in the power of organised labour. Time lost to strikes fell rapidly. Privatisation did lead to efficiency gains for some industries. Privatisation helped cause lower prices for telecoms, airlines and at times electricity. Deregulation of key industries led to greater competition within industries which were formerly monopolies. This competition helped create incentives to be more efficient and cut costs. Reduction in the power of organised Labour. In the 1970s, UK industry was paralysed by strikes and industrial confrontation. During the 1980s, industrial relations improved. 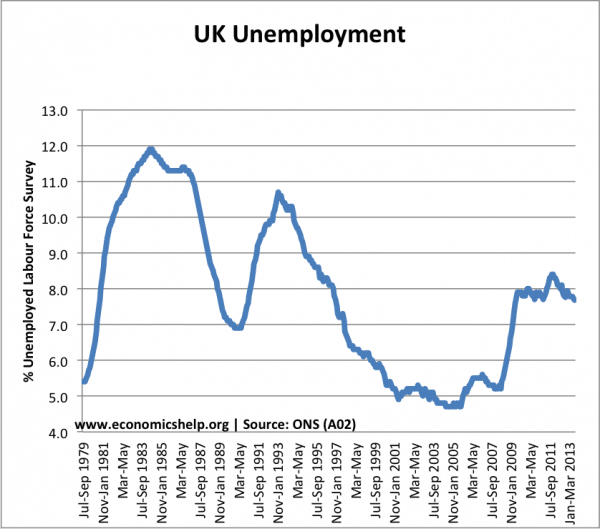 Though this was partly due to much higher unemployment levels. Growth of new service sector and financial sector industries. Rise in home-ownership helped more people feel they had a stake in the economy. The 1980s saw a return of mass unemployment – levels not seen since the 1930s. Two recessions were caused by deliberate policies. Although inflation needed controlling in 1980, arguably the government deflated the economy too much – chasing money supply targets which were unreliable. The cost was unemployment and social disorder, which need not have been so deep. Growth in north-south divide and regional inequality. Unemployment particularly affected former industrial areas; the government were slow to help deal with problems of structural unemployment. The Lawson boom was a missed opportunity. The government deliberately allowed a boom and bust which caused an unnecessary and painful recession of 1991. 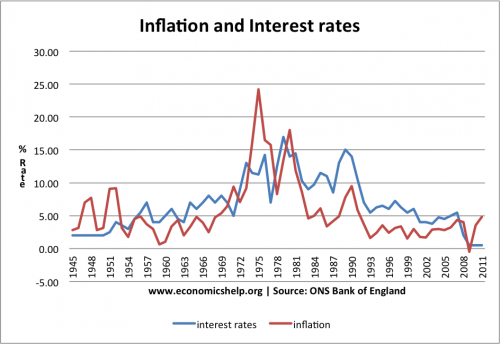 For all Mrs Thatcher’s claims to see the importance of keeping inflation low. It was ironic; the government made such a mistake in allowing an inflationary bubble in the late 1980s. Part of the reason is that they really felt they had created a supply side miracle – which hadn’t actually occurred. The rise in home-ownership was good for those who could buy but has increased wealth inequality in the UK. The supply of council homes is now at record lows because many were sold off. Large rise in inequality during the 1980s. Financial deregulation of the 1980s laid the framework for credit bubble of 2000s and subsequent credit crisis. 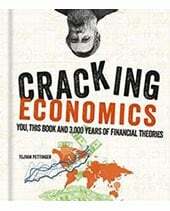 For example, privatized building societies like Northern Rock, and Bradford & Bingley pursued risky growth strategies which eventually needed government bailouts in the aftermath of the 2008 recession. Financial deregulation was good for some, but arguably created greater financial instability in the long-term. Thatcher reduced the power of trades unions, but arguably at the cost of alienating many working class because of the fierce nature of her conflict. Privatisation involved selling off state assets at an undervalued price. Many who could afford to buy shares, saw immediate gains. This was politically popular, but another missed opportunity to use nations resources to invest in the future. Thatcher made little attempt to deal with environmental issues during a decade of increased concerns over global warming, pollution and environmental degradation. Sometimes it is hard to separate how much politicians are responsible for certain events. For example, I don’t believe Thatcher was personally responsible for the dramatic change in the composition of the British economy. The process of de-industrialisation and growth of service sector was inevitable, whatever politicians had done. However, her stubbornness in 1981, did mean we experienced a much deeper recession than necessary. Thatcher’s u-turn speech cemented her reputation as a great politician, but the 365 economists were right. 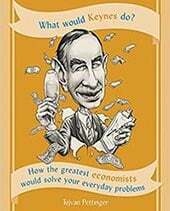 Monetarism was a failure. The social cost of 3 million unemployed is not a price worth paying for being a ‘strong’ leader. 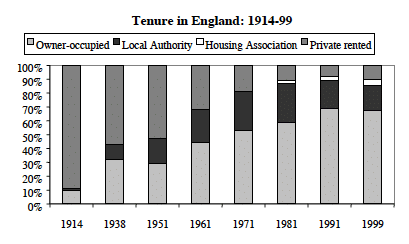 Similarly, the decline in industrial disputes was only partly due to Thatcher’s policies on unions and industrial relations. It was also a reflection of changing economic fortunes. Her determination to defeat the miners (for good or ill) was very important. Other leaders could have sought greater compromise – but this may only have delayed the inevitable de-industrialisation. The supply-side policies of the 1980s were a mixed bag. There is no doubt that some privatised industries saw great strides in efficiency and quality of service – a combination of both privatisation and greater competition. The greater labour market flexibility, she encouraged, could be responsible for reducing the structural unemployment (though it took many years to have an effect). But, at the same time, the deregulation of the finance sector saw a rise in underlying instability, which is a factor behind the credit boom and crunch of the 2000s. Thatcher solved certain problems – high inflation, time lost to strikes, poor manufacturing productivity, but also created new problems. 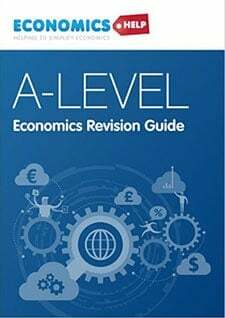 – Mass unemployment, rising inequality and a more fragmented society. It is also ironic that she came to power promising to solve inflation, but left power with an unnecessary inflationary boom, which led to another unnecessary recession of 1991. This entry was posted in uk economy. Bookmark the permalink. ← What could cause the next recession? “Other leaders could have sought greater compromise.” After the fall of the Heath government at the hands of the miners and subsequent ‘winter of discontent’ compromise was not an option. ‘Pour encourager les autres’ comes to mind too. I think overall she is a great leader. She did made a lot of major mistakes though, but she also did a lot of great strides that no president nor prime minister in any country would’ve achieved in such short time span. Nice to read some balanced views on her reign. Whether it is considered a success depends largely on what you think the role of a govn is. If you think a govn should keep unemployment, inflation and inequality low… then she was clearly a disaster.